Join the Mesalands Rodeo Team. 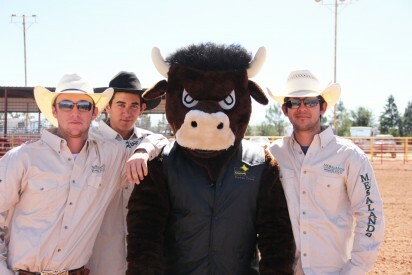 The Mesalands Community College offers Intercollegiate Rodeo Team students a unique college experience. The coeducational team includes students from all over the world that compete in National Intercollegiate Rodeo Association (NIRA) competitions in the Grand Canyon Region. The team has enjoyed impressive collective and individual national standings. The College also hosts an annual on-campus Intercollegiate Rodeo that is greatly supported by the community. Daily practices are held in the first-class, competition-sized rodeo facility adjacent to the College. The facility is outfitted with enclosed stalls, and secure storage for tack, a bucking machine, Heel-O-Matic, steer saver, horse saver, and a robo bronc are available for practice. The College’s caring faculty and small class sizes promotes an effective learning experience for Rodeo Team members. The Team’s winning tradition of producing Academic All-Americans reflects the College’s mission to helping students become well-rounded athletes who are also academically successful. Don’t get left in the dust…Join the Stampede! CNFR pictures courtesy of Dan Hubbell Photography.